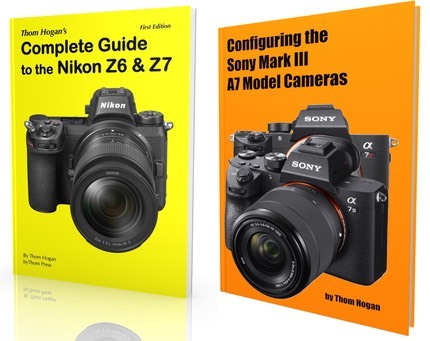 Browsing through the large stack of ads in the Sunday paper, I couldn't help but notice that only two of the mirrorless players seem to be doing any serious coop promotion with stores and dealers: Nikon and Olympus. In Olympus' case, you have to be struck by one thing: selling the E-PL1 for US$349 and labeling it "best seller" must have some impact on the E-PL3 sales in the same flyer (listed at US$649), wouldn't you think? Given that there wasn't any real info telling you why you'd want to pay US$300 for the 3 over the 1, who wouldn't opt for the 1? Meanwhile, the poor E-PL2 still sits silently on the inventory shelves here waiting for its turn in the sun. Nikon, on the other hand, seems to have dropped their DSLR promotion plans for this Christmas season, mostly due to availability of product because of the floods in Thailand. Their approach seems more straightforward than Olympus': let's not promote the latest and greatest that's in low stock, and let's try to blow some of the things we have, especially that new mirrorless system, off the shelves instead. It's that "instead" that's the key difference point. Samsung, Sony, and Panasonic seem conspicuously missing in coop promotion, at least where I live. Pentax, Ricoh, and Leica have too small a presence (i.e. near zero in local stores) to play this game. Perhaps it's different somewhere else, but at least in my neck of the woods Nikon and Olympus will be the ones bringing customers in the door of the local camera shops and big box stores. Funny thing is, NikonUSA has been pulling this highly visible coop advertising thing off for many years now, and it's one of the reasons why they've been gaining market share: it works.